President Trump said he would scrap the name NAFTA, which he claimed had bad "connotations"
After months of intense negotiations, the United States and Mexico agreed Monday on a thoroughly overhauled free trade pact, while talks with Canada are to begin Tuesday. 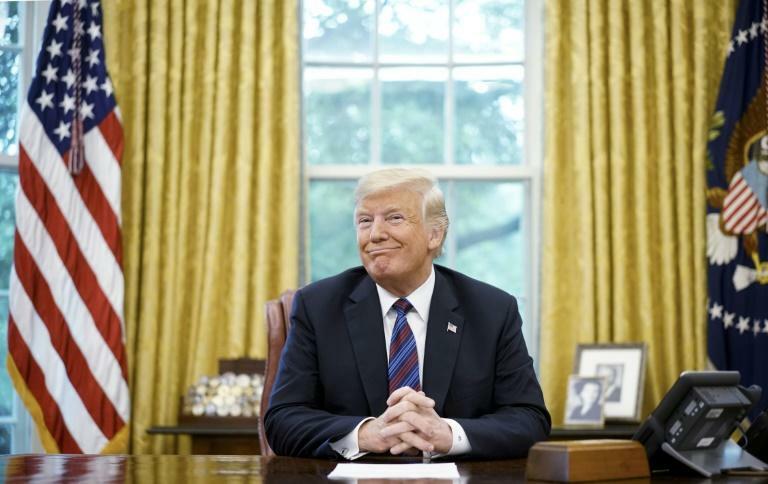 The uncertainty around the 25-year-old North American Free Trade Agreement now revolves around whether it can remain a three-nation deal, as President Donald Trump suggested he could cut Ottawa out. "It's a big day for trade. It's a really good deal for both countries," President Donald Trump said in announcing the agreement from the Oval Office, with Mexico's President Enrique Pena Nieto participating by telephone. With the outlines of a NAFTA 2.0 now on paper, including provisions on auto trade, tougher worker protections and a provision to review the deal every six years, Canadian Prime Minister Justin Trudeau spoke to Trump and said the aim is to reach a new agreement. The leaders "had a constructive conversation" on NAFTA, and "look forward to having their teams engage this week with a view to a successful conclusion of negotiations," Trudeau's office said. Canada's top diplomat and trade negotiator Chrystia Freeland cut short her trip to Europe to travel to Washington on Tuesday to rejoin the talks. Negotiators have worked for a year to update and rewrite NAFTA, but in the last five weeks, Washington and Mexico City had worked to resolve their own differences without Ottawa. Trump stressed that he could go ahead without Ottawa in the new agreement. "We could have a separate deal or we could put it in the same deal," Trump said. The president indicated he would take a tough line with Canada on autos and dairy tariffs, long a source of tension between the neighboring countries. White House economic adviser Larry Kudlow added this warning: "My message to Canada is look carefully." "We hope Canada is watching carefully on how successful negotiations can go," he said. Mexican officials have insisted all along that NAFTA must be a trilateral deal, but also acknowledged that either way it will have free trade commitments with both nations. "It is our wish, Mr President, that now Canada will also be able to be incorporated in all this," Mexico's Pena Nieto told Trump. Pena Nieto said on Twitter he had spoken with Trudeau, urging Ottawa to rapidly rejoin the talks with the goal of reaching a final NAFTA rewrite this week. Freeland's spokesman Adam Austen said Canada "will only sign a new NAFTA that is good for Canada and good for the middle class. Canada's signature is required." The Canadian team could be more amenable to the talks now that the United States has backed away from a controversial and strenuously-opposed provision to require the three nations to renegotiate NAFTA after five years. Instead, senior US officials told reporters the agreement had been extended for 16 years but would be reviewed every six years. If the parties agree to continue with no changes, it will be renewed for another 16 years. However, if the governments want to make changes, they will negotiate while the agreement remains in place, giving them a longer time horizon of 10 years to make changes, which is less likely to spook investors and businesses. "It's an alternative to sunset which we think works," another senior official said. And in fact, financial markets were delighted by the news with the S&P 500 and the tech-dominated Nasdaq stock indexes hitting fresh records. Mexico's peso strengthened against the US dollar, as did the Canadian dollar, while the US dollar index weakened slightly. US Trade Representative Robert Lighthizer told reporters in a call that the agreement was "historic" and provided the "highest standards" of any existing agreement on digital trade, financial services and labor rights. "We had a NAFTA agreement that had gotten seriously out of whack, that led to large trade deficits and needed updating," Lighthizer said. The labor protections are "stronger and more enforceable than any agreement by a mile. It's not even close." And he said the new pact would create jobs in the United States and Mexico. Lighthizer said the administration would notify Congress by Friday of the new agreement, which would allow the required 90 days' notice so that Pena Nieto could sign the deal before handing over the Mexican presidency to President-elect Andres Manuel Lopez Obrador on December 1. A senior administration official said the notification would highlight the US-Mexico deal with the hope that Canada would join. However, it was unclear whether the administration had the authority to substitute NAFTA with a bilateral trade agreement. 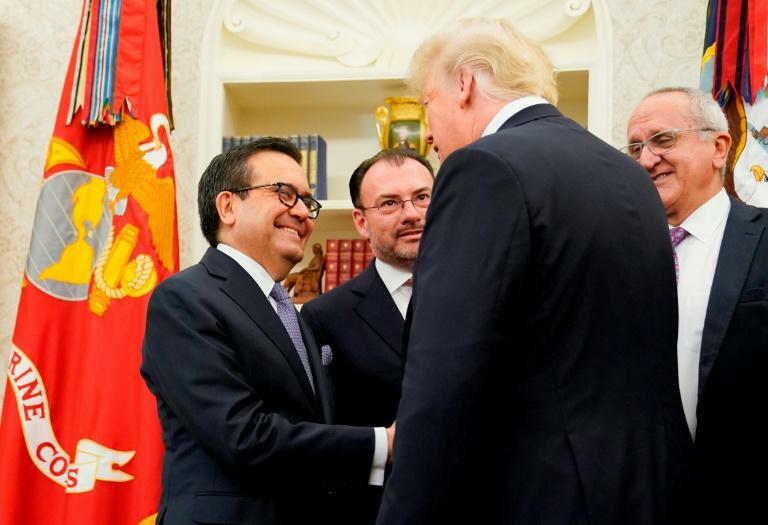 Mexico's Foreign Minister Luis Videgaray told reporters that if the United States and Canada fail to agree to the new terms, Mexico would still benefit from an existing pact with Ottawa through the Trans-Pacific Partnership -- the deal Trump withdrew from as soon as he took office. A key element of the US-Mexico talks has been content requirements for autos, which Mexico agreed to increase to 75 percent from North America to get duty-free NAFTA treatment. The sides also agreed that 40-45 percent of cars must be made at "high wage" factories where workers are paid $16 an hour in order to receive duty-free treatment, something that could deter US factories from offshoring to Mexico.